Jermell Charlo (26-0, 11 KO) edged Vanes Martirosyan (34-2-1, 21KO) in a unanimous decision to remain undefeated in a competitive 10-round junior-middleweight bout from Las Vegas, Nevada. The final scorecards were 97-93, 96-94, 96-94. Probably one of the most even affairs of this year. Similar physically, both fighters adopted an identical strategy against the other, use of the jab to land the straight right hand. Martirosyan appeared to have a power advantage and pressed forward as Charlo moved away trying to keep distance. For the first several rounds, Martirosyan mixed his attacks to the head and body and even hurt Charlo with a left hook to the body in the first round, only to abandon the body attack to become a head hunter towards the middle rounds. Conversely, Charlo was intent on landing a check left hook as Martirosyan closed the distance with his right hand, and for the entire fight missed by miles as his left hook was wide and too slow to catch a dipping Martirosyan. However, Charlo was able to occasionally land lead long, looping left hooks around the guard of Martirosyan. The momentum changed in favor of Charlo in the middle rounds as he outworked Martirosyan, primarily with the jab. Charlo landed a jab as Martirosyan came forward with the usual one-two combination. Martirosyan's momentum sent him crashing into Charlo causing a clash of heads which created a cut over Martirosyan's left eye. He finished the remainder of the around as the aggressor having success with his usual jab-straight right combination, occasionally throwing the right hand as a counter. Overall, Charlo out landed Martirosyan, landing more jabs as Martirosyan had the advantage in power shots. Just as Vasyl Lomachenko redeemed himself after defeating Gary Russell, Jr. in June 2014 following his defeat to Orlando Salido, Russell, Jr. had to rid himself of the stigma of being overrated after losing to Lomachenko. Ah, but Russell was tailor-made for Lomachenko. Russell's deficient 64-inch reach forced him to have to use his legs to cover ground against a taller, longer fleet-footed fighter in Lomachenko whose foot-speed is unrivaled. The slower-handed Lomachenko easily won by being outside of Russell's range. In Gonzalez, Russell was facing an opponent who had slower hand and foot-speed than himself, the usual, only this opponent was credible. True to his counter-punching tendencies, Gonzalez was inactive in the first round as he tried to time Russell's advances. Unless Gonzalez chose to be more aggressive, Russell only had to take his time and avoid being overzealous. For as long as Gonzalez could not time Russell, he was forced to rely on his reflexes, which could not compete with Russell's speed. Barring a knockout, Russell could have pot-shotted Gonzalez all night with jabs, straight left hands, and right hooks. In and out, Russell did to Gonzalez what Lomachenko did to him. Russell, Jr. dominated round one with his right jab. In round two, Gonzalez was more active, managing to land some right hands. Russell began landing his straight left hand in addition to his jab. Russell knocked down Gonzalez with a straight left hand followed by a right hook in the third as Gonzalez nearly cornered him. Gonzalez failed to get through the fourth round going down twice. Referee Tony Weeks called off the fight in the fourth round after Gonzalez went down for the second time in the round, despite it appearing that no clean punches were landed. Gonzalez was regarded as a potential threat to Lomachenko. This fight suggests that a fight against Lomachenko would have also been a stylistic nightmare for Gonzalez. In and out, Lomachenko would have moved more quickly than Russell while having significantly greater reach. Like Russell, Lomachenko is a southpaw. 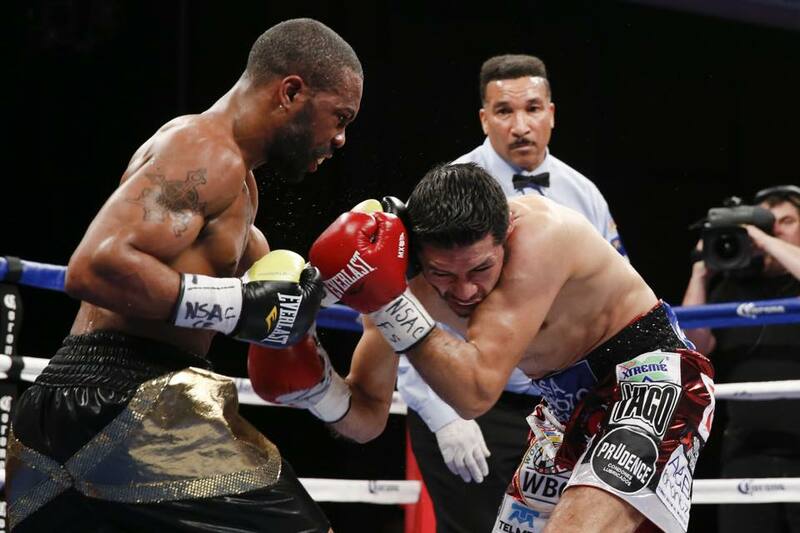 Gary Russell, Jr. improves to 26-1, 15 KO en route to capturing the WBC Featherweight title. Jhonny Gonzalez is 57-9 with 48 knockouts. Gonzalez pummels Russell and Charlo defeats Martirosyan.